I’m getting very close to being ready to publish my second book in the Rockin’ Austen series, Sharnita with the Blue Nails. Today, I’m going to have Brit Byers, of Brit with the Pink Hair, introduce Sharnita to you and do a little interview. Enjoy! Brit: Welcome, Sharnita. Or would you prefer Shar? Shar: Either is perfect. Shouldn’t I be interviewing you though? You’re the famous one. Brit: My dad’s the famous one. Anyway, this is about you, not me. You’re the one who’s been on TV before, right? Some singing show? What was that like? Shar: I was a contestant on a show called Next Canadian Superstar, but I was eliminated right before the live shows started. It was a lot of fun. A lot of work, even though I wasn’t on the show for very long. I just missed out on the Top 24. I would’ve liked to have had a chance to perform in front of a live audience. Brit: Don’t sell yourself short. I can barely carry a tune. So you just started as a bartender at Club Stanza, but is singing what you want to do? I won’t tell my dad, don’t worry. Shar: Singing and acting yes. Ideally, I’d make it to Broadway someday. Brit: Let me see if I have any connections in New York. Maybe I can hook you up. Do you have much experience in musical theater? Shar: That would be amazing! I do. I was involved in musicals in high school. I had one starring role as Velma Kelly in Chicago, which was awesome. I also sing in my church choir. Brit: Great, now for the juicy stuff. A game of Fu—oh wait, you don’t swear, do you? I’ll try to clean it up just for you. Eff, Marry, or Kill. Mike, Cord, or who’s that young bartender? The ripped one? Brit: Sure. Mike, Cord, or Gunner. Shar: Hmm, that’s a tough one. Can we do Kiss, Marry, or Kill? Brit: No. How about Heavy Petting, Marry, or Kill? Shar: I can live with that. I’ll go with marry Cord. He seems like a stable guy, but still really cute. Heavy petting with Gunner because—well, you’ve seen him. He could use me as a barbell at the gym, and I’m not tiny. And…kill Mike, but please don’t tell him! I don’t want to get fired. Brit: My answer would’ve been the same, so your secret’s safe with me. Thanks, that’s all the time we have because your break is probably over now, and we don’t want Mike to kill you first. Thanks, Shar! Shar: Thank you, Brit. This was fun! 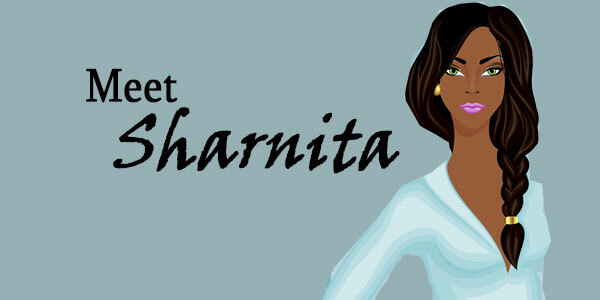 Stay tuned for much more Sharnita very soon!